Trying to write a complicated formula to cut carbon emissions, the Environmental Protection Agency thinks it has found a magic number: 5.8. The agency is trying to complete a rule governing carbon emissions from power plants, and among the most complicated and contentious issues is how to treat existing nuclear power plants. Many of them are threatened with shutdowns because cheap natural gas has made their reactors uncompetitive. The agency’s proposal gave an odd mathematical formula for evaluating nuclear plants’ contribution to carbon emissions. It said that 5.8 percent of existing nuclear capacity was at risk of being shut for financial reasons, and thus for states with nuclear reactors, keeping them running would earn a credit of 5.8 percent toward that state’s carbon reduction goal. Since receiving tens of thousands of comments on the proposal, the agency is now reviewing the plan. It must evaluate all comments before it sets a final rule, which it hopes to do by June. That rule, however, is likely to be challenged in court. Under the proposed formula, if a state closed a 1,000-megawatt nuclear plant and replaced 5.8 percent of it, or 58 megawatts, with carbon-free electricity, it would be deemed to be “carbon neutral.” The state would reach the benchmark even if the other 942 megawatts of power generated came from a carbon-emitting source like natural gas combustion. Conversely, a state that kept all its nuclear plants open until 2030 could claim a credit for 5.8 percent toward its carbon reduction goal. The 5.8 percent figure for nuclear power plants puzzled even opponents of such power sources. “It’s a pretty arbitrary number, I’ll grant them that,” said Michael Mariotte, the president of the Nuclear Information and Resource Service, an activist group that is adamantly opposed to anything nuclear. “Replacing 5.8 percent of any power plant is sort of an odd concept,” he said. Mr. Mariotte, though, said that some reactors could be retired without driving up carbon emissions. “We’re not convinced that a lot of it needs to be replaced; some of it’s just excess power,” he said. The proposal prompted the American Nuclear Society to coordinate a letter-writing campaign to persuade the E.P.A. to help the reactors. States should get credit for any actions they take to hold down carbon emissions, said Craig H. Piercy, the Washington representative of the group. “A pound of carbon reduced anywhere ought to be treated the same,” he said. Still, he said, in the draft rule, the nuclear industry fared better than hydroelectricity, the second-biggest source of carbon-free electricity, which got zero credit. Mr. Mariotte of the Nuclear Information and Resource Service and other nuclear opponents appear to be mostly concerned that the reactors, which they regard as unsafe, could get a new lease on life. His group and others sent a letter to the E.P.A. complaining about a related issue: that the draft carbon rule requires that states with reactors under construction continue building them, or face even harder-to-meet carbon targets. In fact, the question of where to draw the baseline — that is, the date from which the calculations start — is common to many aspects of the carbon rule. Senator Bob Casey Jr., a Pennsylvania Democrat, made a similar point in a letter to the E.P.A., saying that the rule should take into account previous work to promote clean energy sources, and to maintain existing nuclear plants. Assumed in the E.P.A.’s planning is that the five reactors currently under construction in the United States will go online. 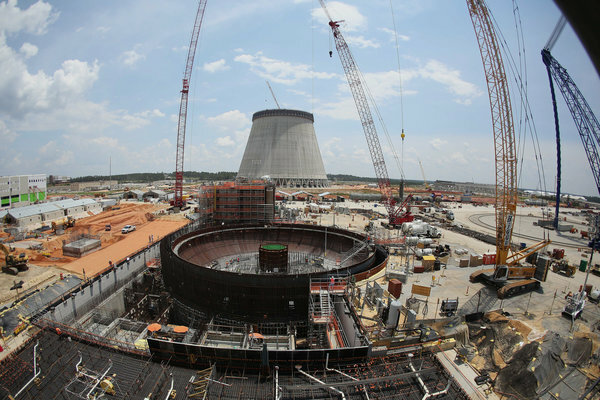 A twin-reactor Vogtle plant is planned near Augusta, Ga., and another twin-reactor plant is in development in South Carolina. In Tennessee, a reactor that the Tennessee Valley Authority started 40 years ago is almost complete. They are each multibillion-dollar projects, and certain to raise electricity prices, but because work began before the rule was proposed, the carbon-cutting goals set by the E.P.A. for those states do not include the reactors. Energy experts inside and outside the nuclear industry said that cutting carbon emissions was worth money, and paying slightly above-market prices to keep a 40-year-old reactor running for 20 more years might cost less, per ton of carbon emission prevented, than building wind or solar plants, or coal plants that capture their carbon dioxide. Federal subsidies for wind energy, he said, are “knocking reactors off the system” by driving down energy costs, he said. Some traditional environmental groups, though, are reluctant to embrace more credit for existing plants. Daniel A. Lashof, the chief operating officer at NextGen Climate, the environmental advocacy group started by the climate advocate Tom Steyer, argued that the bigger issue was not what should keep running, but what should be built.